In the following guide, we aim to answer that question by offering an in-depth review of the best RV TVs currently on the market and a detailed analysis of what goes into the making of the ideal RV TV for every type of RV. Let’s start off with our top picks of the best 12V RV TVs per category for 2019. 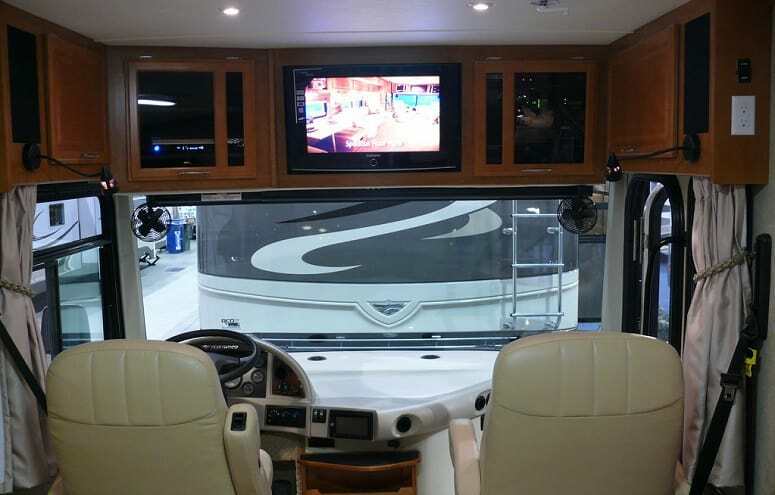 Why Do I Need A TV In My RV? How Do I Mount My 12 Volt RV TV? SuperSonic is one of the most recognizable brands for RV TVs, and for good reason. They’ve not only created the very best RV TV for multiple setups and types, but they’ve kept it at a rock bottom price without skimping on the quality. Grabbing a SuperSonic TV allows you to reap the full benefits of the color balance and anti-glare technology of the screen, and also comes with a PC-in plug to display your laptop’s streaming videos or files on the screen. The latter makes this excellent for working on the road, transforming the living space into a mobile workspace when needed. You’ll start to run into a problem with the volume however. While the audio quality is great and there’s no audio imbalances, you’ll have to hit about 35 on the volume just to be able to hear it from across the room. That’s also if nobody is talking or you don’t have a portable generator running. One of the most common problems with RV TVs is running into dead pixels after about a year of use. This is a mix of bumps from the road and slightly inconsistent electrical signals, and SuperSonic falls victim to this as well. You might get 2-3 dead pixels after a year of use. Energy Star-rated, bright LED lighting and a balanced picture 100% of the time: those are just a few of the reasons this peaked our list, alongside the lightweight build and simple installation. SuperSonic continues to be the king in this space, making them the best 12 volt TV for RV brand out there. If you’re after a bit of a higher picture quality, a Jensen RV television delivers on all fronts. First of all, you get crystal-clear HD picture, as well as a generous viewing angle. Since tube-style televisions stopped being produced, the main struggle with flat screens has been keeping color and clarity no matter what viewing angle you’re standing/sitting at. Jensen TV took care of that. Another killer feature is their fantastic power consumption rating: you’ll be able to watch more movies and episodes of Game of Thrones before the power supply runs out that you’d be able to a standard television. The Jensen 12 volt TV simply extends your media viewing time, no matter what. But there are a few areas where the Jensen RV TV falls flat. For one, when you get your 12V wires, they’re simple stripped wires with no plugin. You’ll need to do a bit of DIY work during the installation process. Apart from that, the sound isn’t the best. This hits a slightly higher price point, and we were a bit upset to learn that the volume is fine, but the audio quality can lack when you hit certain frequencies (loud explosions in a movie, shouting, etc.). We would recommend getting a soundbar to go with this TV. Full HD picture in a 16:9 aspect ratio, clear lines and angles, and enhanced viewing experience for the whole family. This 32” RV TV gives everyone a piece of the action without having to cram next to each other during viewing. We took a look at all the Axess TV reviews we could find before committing to testing this, and it built up a lot of hype: they delivered on every bit of it. While this RV TV doesn’t recognize mp4 files from your phone or laptop (download, locally stored movies for example), it makes up for it in other areas. The biggest draw to this Axess TV is the excellent balance on the audio. Not only do you have a proper volume setting (for example, you don’t have to crank it to 35 or 40 just to be able to hear it), but you won’t need to buy a soundbar just to get proper depth. When it comes to setup, it comes with the stand screwed in, so you’ll simply have to remove that and hook it up to your 12V source and you’re good to go. USB, HDMI and an antenna setup make this a very versatile TV for your RV. You are going to have to deal with a rather narrow viewing angle, which can be quite a challenge if there’s more than two of you. Sitting straight ahead is perfectly fine, but once you’re about 45 degrees off-kilter, the picture starts to morph a bit. Altogether, you get a very energy-efficient model with a ton of color correction options, wrapped-up in a decent 19” display. Saving money, saving energy, and maximizing your fun time when it’s either raining or you’re in for the night. SuperSonic just can’t be beat. Our last RV TV on the list today has a compact 24” size, while still remaining lightweight enough to move from space to space if you don’t plan on installing it right away. On that note, installation is extremely simple. Simply plug into the 12V adapter, and you’re ready to go. SuperSonic also included a helpful owner’s manual to troubleshoot any unforeseen problems with installation, some of which may be unique to specific RV makes and models. Even with the 24” screen and HD resolution, you’re still going to find yourself sitting directly in front of this, or not enjoying it at all. It has a very narrow viewing angle, so you’ll have to be within ten degrees of a straightforward view if you want to see the screen without distractions or faded colors. Our last gripe with this model is that the DC cable that’s included is a bit flimsy, not of the highest caliber construction. Other than that, the color correction settings and clear-cut audio make this an excellent and attractively-priced RV TV. Just because you’re out on the road doesn’t mean you can’t enjoy a bit of R&R with an HD TV hooked up to your 12V power supply. There are other, more convoluted ways to get a TV set up, but those methods drain far too much power. We’ve grabbed the best energy-efficient, HD televisions for your RV to bring a bit of home on the road with you. Whether you’re full-timing it or just spending a bit of your weekend out on the road, not every moment is going to be filled with adventure. To entertain yourself and fill in the gaps in between the fun parts, having a TV can help the time go by or allow you to drift off to sleep if you’re riding solo. It’s nice to have a bit of white noise if nothing else. You’re outside of your home town or city, you’re not used to the weather, and apps are only so reliable. Watching local weather stations from picking up local signals gives you an opportunity to stop, stock up and prepare for the worst of potential inclimate weather if it’s headed your way. This little trick works very well if you’re heading into a hurricane zone. You have local weather, but you also get information about the city or town you’re going through. Many programs, especially on Sunday mornings, talk about local places to try out and show spotlights on events, and where to buy tickets. If the TV isn’t your primary source of entertainment, it can be a well of information to help you find the perfect way to spend your weekend. Even though we’ve discussed the difficulties of viewing angles in this guide, most of these televisions come with an anti-glare coating on the screen. You have numerous sources of sunlight at different angles while you’re on the road that can interfere with viewing the TV, especially if your passengers are watching it while you’re driving. Depending on your RV setup, you can forego the stand and securing it by embedding your TV in the wall. The internal chassis keeps this perfectly still and straight throughout your ride, so you won’t have to have the worry of damaging your TV on your mind while you’re on a bumpy road. Normal televisions are designed for home use. You know, that place that’s always at a reasonable, comfortable temperature. 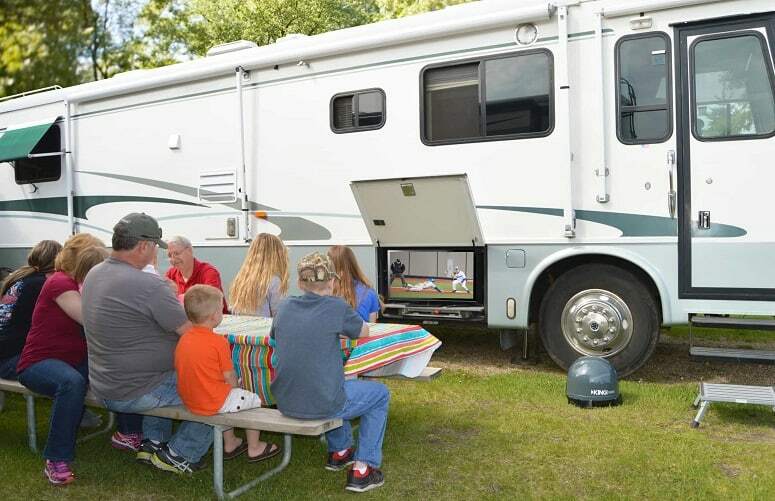 Your RV isn’t always going to be perfectly warm, so you need a wider operating temperature. Let your adventure and the road take you where you want to go, don’t be restricted by your gear. Even if you have a proper stand and screw it in somewhere, they’re not built to withstand the sway and shock of moving around. If you get a TV that’s designed for your RV (a lot of them are also designed for boat use), the stand is/actual TV build is much sturdier. You can’t keep the conditions in your RV 100% perfect, especially when you’re travelling around the country to new and exciting areas. RV TVs have humidity resistance, so you won’t end up with electrical issues or damaged components from the weather. You’ll have to get a mounting bracket for a standard TV, which means you run into additional costs and more screws in the wall. Standard TVs come with stands because they’re not meant to have a versatile setup. The less you can do to get everything set up and working, the better off you’ll be. It’s true that you usually run into a lower cost, but again, you have to consider mounting it and how expensive that system is going to be. Initial costs are usually lower because you don’t have humidity and vibration protection like RV TVs come with. You’ll note that a lot of our products on here are SuperSonic brand. That’s because there aren’t a lot of companies that make RV TVs, making them a lot harder to find. 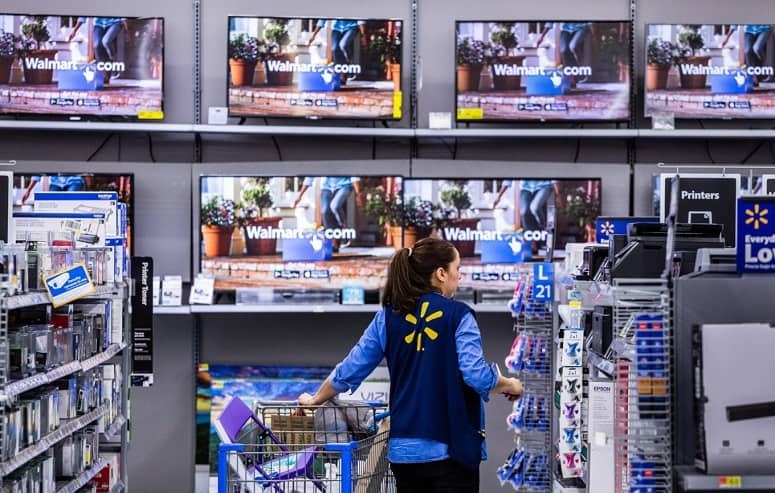 You can go into any Walmart and find a row of TVs in different brands, sizes and features, but almost none of them will be appropriate for your RV. Bigger is better, but when it comes to your TV, there’s such thing as too much of a good thing. Buying too big and having an oversized TV in your RV is only going to be an inconvenience. You’re close enough that you can still get a lot of value from a smaller screen. You’re not always going to have access to satellite or cable, so you need to have backups in mind. While not a lot of folks are using DVDs these days, they do have their place. No Netflix when you’re out on a desolate highway and your teenager wants to watch a movie, so having a built-in DVD player and a small collection of movies is the way to go. So we just told you not to get a TV that’s too big, but you don’t want to sacrifice your viewing pleasure, either. Measure the space, look out for TV sizes, and understand how it’s going to impact the price. With RV TVs, you can get a great model around 24” for a hundred bucks if you’re looking for a budget-friendly pick. USB, HDMI, PC cable slots, anything that can make it a lot more user-friendly. This gives you the option to view media from your local laptop storage, format and fill a USB drive with films, or simply use the TV as a louder music player for those riding in the back. Nobody wants to be a power hog. You need to conserve as much energy while you’re out on the road, especially if you’re waylaid by the rain and can’t run a portable generator. There’s not much to do, so sitting by and watching an energy-efficient TV is a great way to pass the time without draining your battery. Look out for Energy Star ratings and kWh usage. Is it flush with the designated TV space, or do you need to mount everything freshly into the wall? 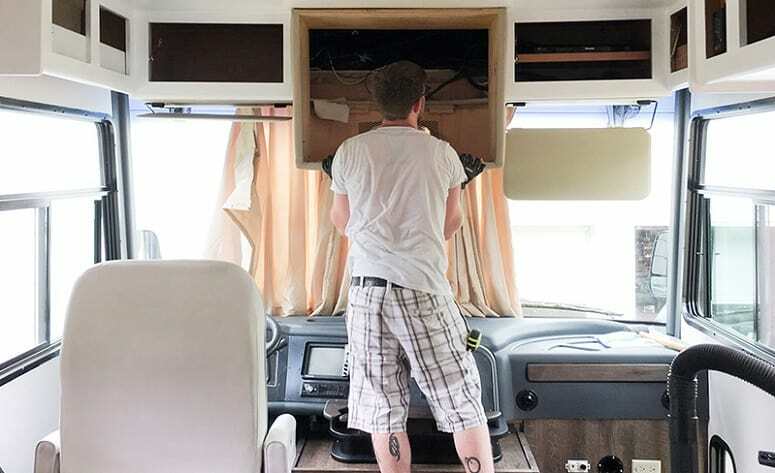 This depends mostly on your RV, as the TVs we’ve selected will have one form or another of mounting spots to secure it to your interior. You’re going to be left with two option. You’ll either utilize the hanging sections in the rear of your TV’s chassis, or you’ll have to grab a wall mounting kit. You’ve seen these brackets holding up 60”+ televisions on the wall before. You’ll want to inspect your RV beforehand and determine if there’s a way to hang it flush with the wall. This is going to ensure the least amount of invasive methods, less drilling and running wires, etc. 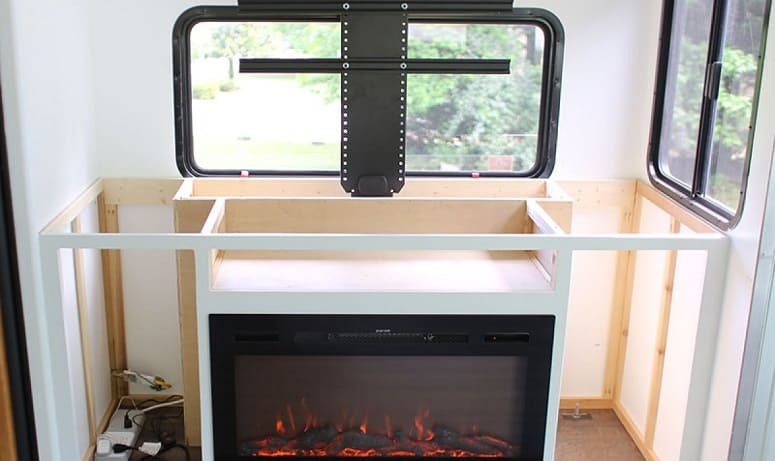 If your RV didn’t come with an area that’s flush for the TV to hang on, you could always use the included stand and screw it into a counter or table. This is more of a last-ditch effort, but will work if you need to secure your RV TV while driving. Whichever RV TV you go with, you’ll be augmenting your RV experience. Not every minute can be filled and flooded with excitement and adventure, and that’s why we have televisions: to cull the boredom. Grab the right fit for you, quickly install it, and you’re ready to go. Thanks for all the great info. My ideal solution for my camper van is to have a thin 12V TV that I can simply plug in a USB flash drive with movies on it and play directly on the TV. I see most of these say “USB compatible” but I don’t know if that actually means the TV has a built-in media player or can simply allow USB input from a computer or can use it to load new firmware updates, etc. Is this something you tested?